Comprised of three dynamic young string players, VARIATION STRING TRIO is now entering its eighth season. 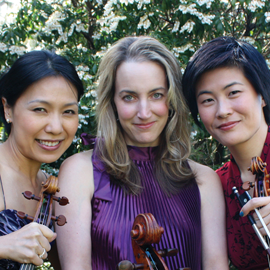 Violinist Jennifer Koh, violist Hsin-Yun Huang and cellist Wilhelmina Smith formed the trio in the fall of 2005 after performing together to great acclaim at Salt Bay Chamberfest on the coast of Maine. They have performed in chamber music series across the United States, including Classicfest in Pensacola, FL, Salt Bay Chamberfest in Damariscotta, ME, and Performers of Westchester in Westchester County, NY. They made their European debut in Geneva, Switzerland in February 07and are scheduled to perform uocoming seasons at the Philadelphia Chamber music Society, Sejong Presents at Carnegie Hall, and the Moritzburg Festival in Germany. Unique among chamber music groups, their name, Variation, describes both their commitment to the repertoire for string trio (highlighting an exquisite arrangement of Bachs Goldberg Variations) as well as their ideal of collaborating with a range of guest artists, regularly varying and enhancing their musical offerings.